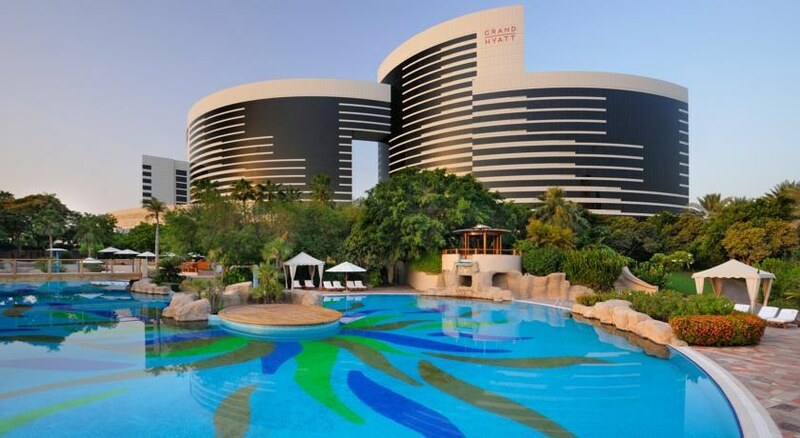 Grand Hyatt Dubai is one of the most luxurious and modern family friendly hotels in Dubai. It features luxury rooms and suites with view of Dubai's skyline, restaurants and bars, spa, swimming pool, tennis courts and fitness centre. With 674 elegantly furnished rooms and 42 suites, the hotel promises a comfortable and luxurious stay with a touch of Middle Eastern hospitality. There are amazing restaurants catering an array of international cuisines like Italian, Indian, Asian, Singaporean and Japanese. Located centrally with proximity to attractions like Wafi City Mall Children's City and Creekside Park, the hotel is a favourite choice for tourists to Dubai looking for an exciting fun-filled city break. There are a host of recreational opportunities, indoor and outdoor pools and a Kid’s Club. Grand Hyatt Dubai is around 7km from the Dubai International airport. The hotel is close to Wafi City Mall, Creekside Park and Children's City. Restaurants like Sushi, Qbara and Panini are located near to the hotel. There are 682 rooms and 186 apartments at the Grand Hyatt Dubai. The rooms feature minibar, 25-inch television, DVD players, dual line phones with voicemail, coffee making machine and in-room safe. There is a marble bath, hairdryer, bathtub and other bath amenities inside the bathroom. The suites feature kitchenette and separate work, sitting and bar area. Iron/ironing board is provided on request. Grand Hyatt Dubai features wellness and fitness centre offering luxurious spa treatments to the guests. There are saunas and steam rooms inside the centre. There are indoor and outdoor swimming pools at the hotel. The hotel also has tennis court for the tennis lovers, and a kid’s club where the kids can enjoy themselves all day long. The hotel also offers cooking classes for the guests. These classes are conducted mostly on the 1st Saturday of every month. The Tourism Dirham is a marginal charge paid by guests depending on room and property type and reflects as a separate item in bill. We informed you that the daily beach shuttle to Kite Beach for our in-house guests will be replaced with a daily complimentary shuttle service to La Mer Beach (a public beach), with immediate effect. La Mer presents the best of sun, sea and outdoor fun in Dubai. A fine addition to the city’s urban beach cred, the inspirational destination features wide open spaces with palm tree-lined boulevards, graffiti art murals and laidback charm. La Mer is become favorite address for Beach life, Dining, Shopping, Leisure and Urban art.